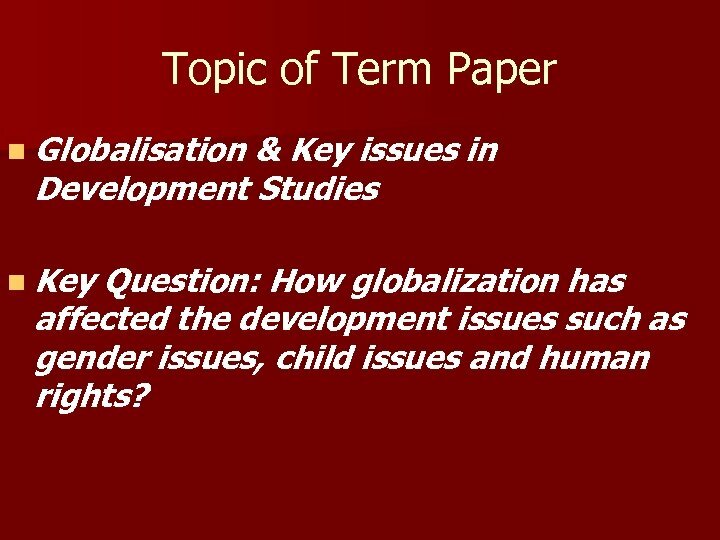 Topic of Term Paper n Globalisation & Key issues in Development Studies n Key Question: How globalization has affected the development issues such as gender issues, child issues and human rights? 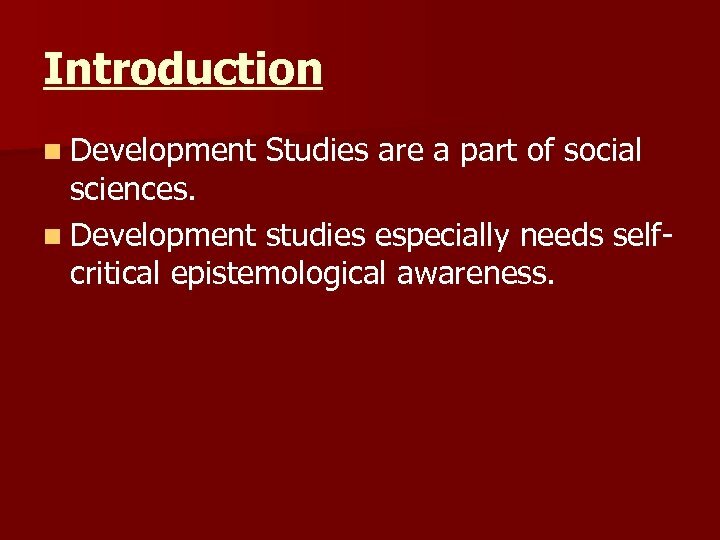 Introduction n Development Studies are a part of social sciences. n Development studies especially needs selfcritical epistemological awareness. 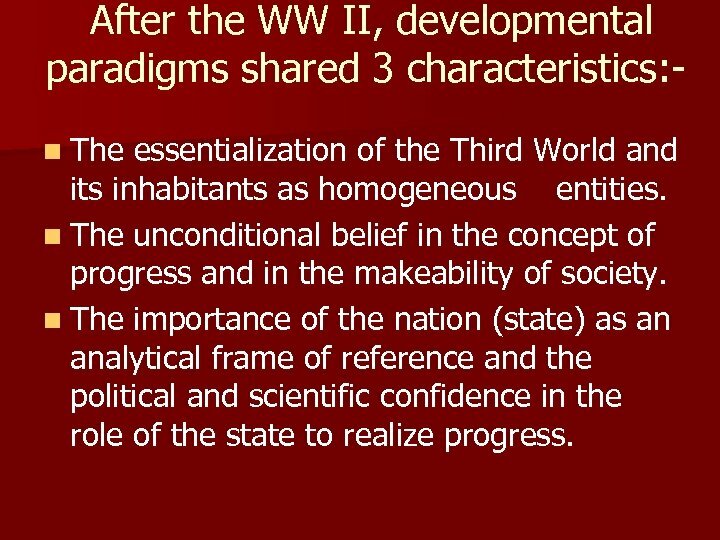 After the WW II, developmental paradigms shared 3 characteristics: n The essentialization of the Third World and its inhabitants as homogeneous entities. n The unconditional belief in the concept of progress and in the makeability of society. n The importance of the nation (state) as an analytical frame of reference and the political and scientific confidence in the role of the state to realize progress. 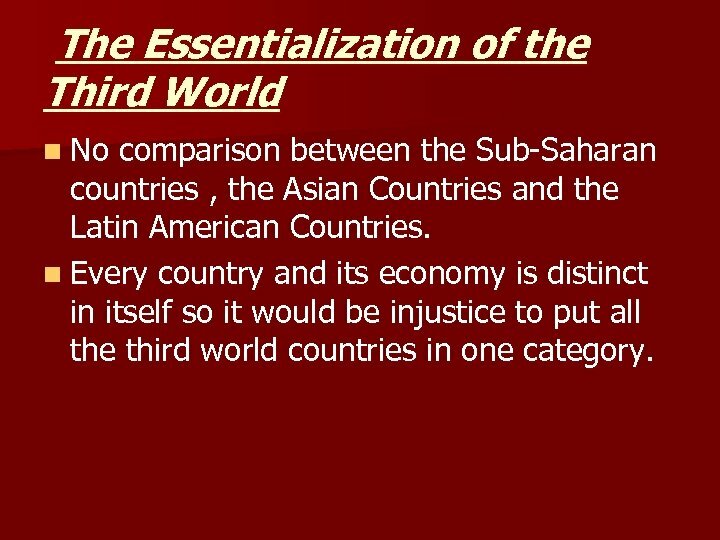 The Essentialization of the Third World n No comparison between the Sub-Saharan countries , the Asian Countries and the Latin American Countries. n Every country and its economy is distinct in itself so it would be injustice to put all the third world countries in one category. The end of the belief in progress n In 1990 s the idea of the belief in progress was changed into growth. 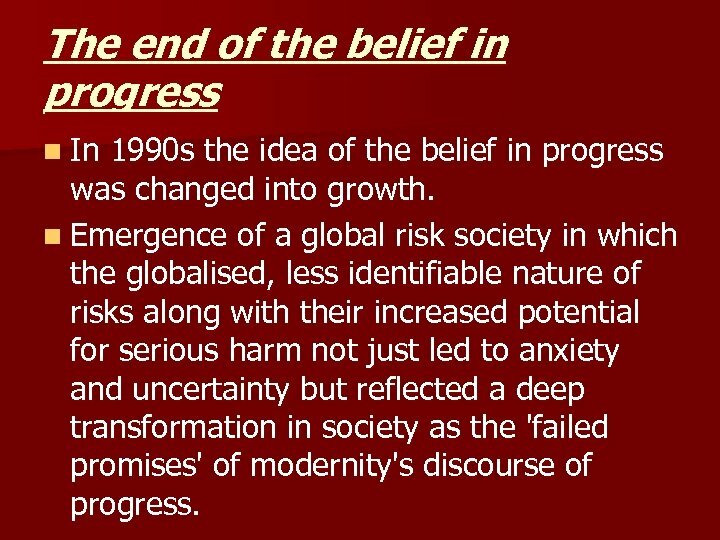 n Emergence of a global risk society in which the globalised, less identifiable nature of risks along with their increased potential for serious harm not just led to anxiety and uncertainty but reflected a deep transformation in society as the 'failed promises' of modernity's discourse of progress. 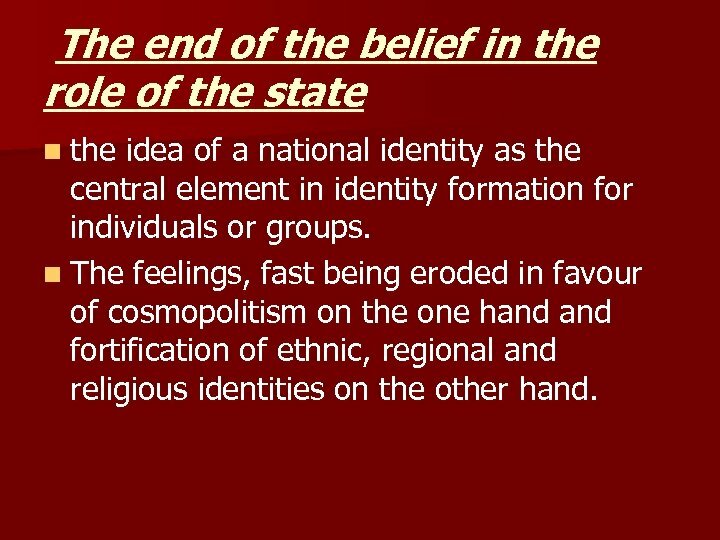 The end of the belief in the role of the state n the idea of a national identity as the central element in identity formation for individuals or groups. 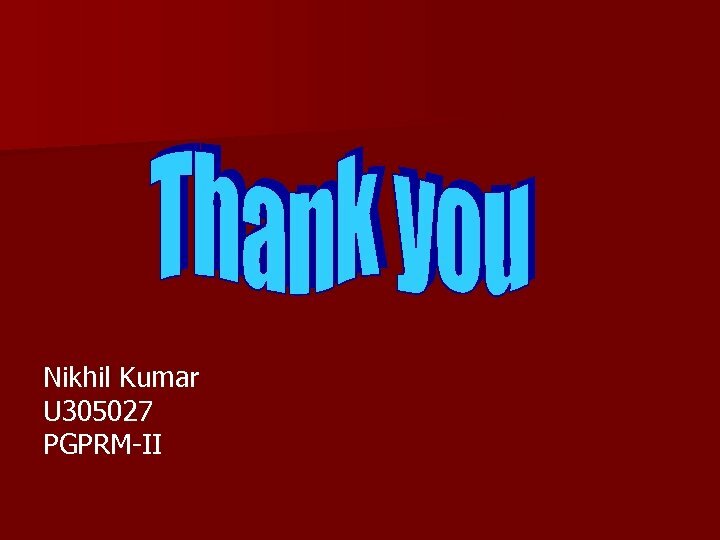 n The feelings, fast being eroded in favour of cosmopolitism on the one hand fortification of ethnic, regional and religious identities on the other hand. 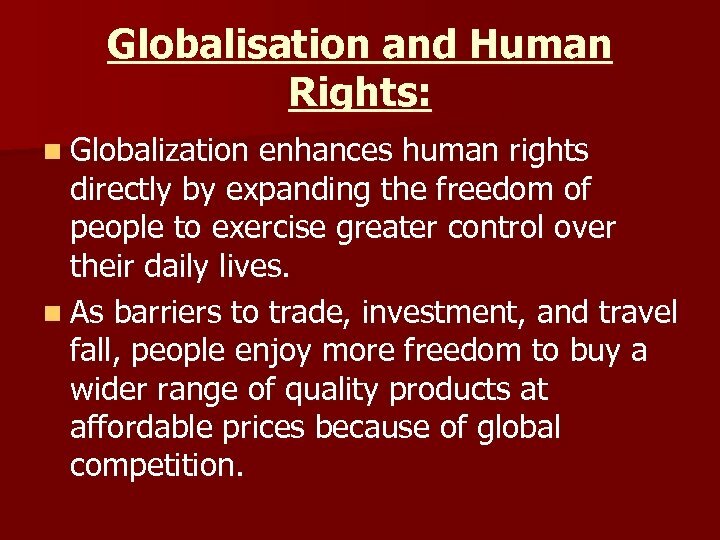 Globalisation and Human Rights: n Globalization enhances human rights directly by expanding the freedom of people to exercise greater control over their daily lives. n As barriers to trade, investment, and travel fall, people enjoy more freedom to buy a wider range of quality products at affordable prices because of global competition. 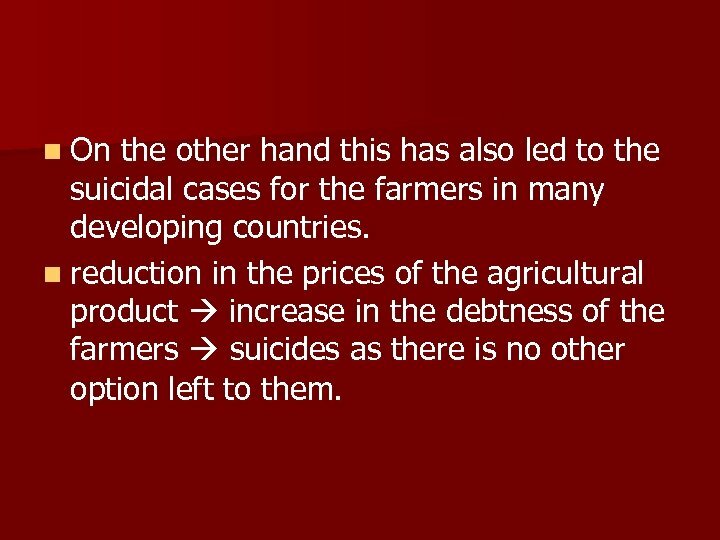 n On the other hand this has also led to the suicidal cases for the farmers in many developing countries. n reduction in the prices of the agricultural product increase in the debtness of the farmers suicides as there is no other option left to them. n Globalisation distorting Government Policies. n More stringent to the immigrants. 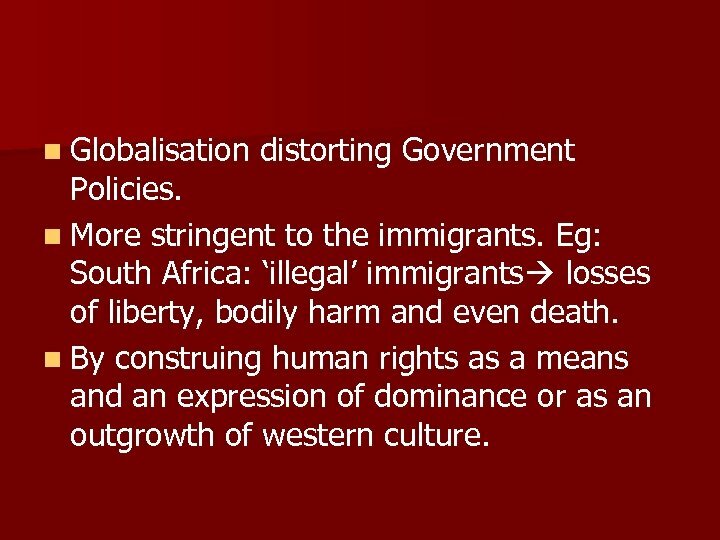 Eg: South Africa: ‘illegal’ immigrants losses of liberty, bodily harm and even death. n By construing human rights as a means and an expression of dominance or as an outgrowth of western culture. 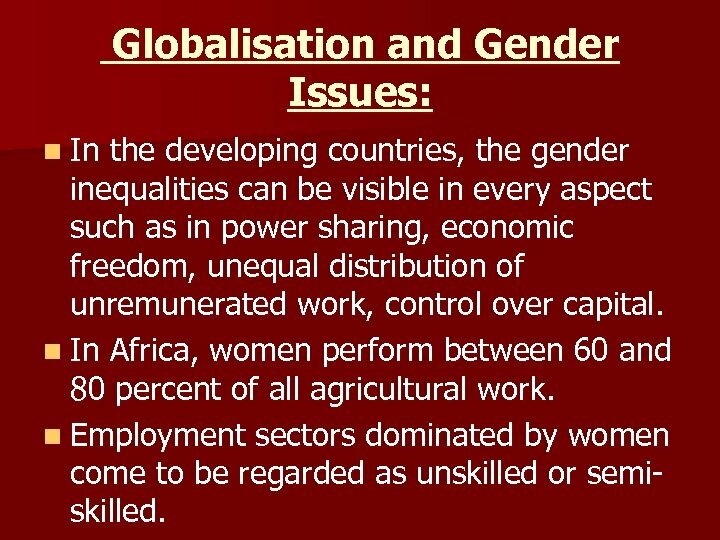 Globalisation and Gender Issues: n In the developing countries, the gender inequalities can be visible in every aspect such as in power sharing, economic freedom, unequal distribution of unremunerated work, control over capital. n In Africa, women perform between 60 and 80 percent of all agricultural work. n Employment sectors dominated by women come to be regarded as unskilled or semiskilled. n The women in the developing and the under-developed countries got the voice and the strength to oppose the world institutions. 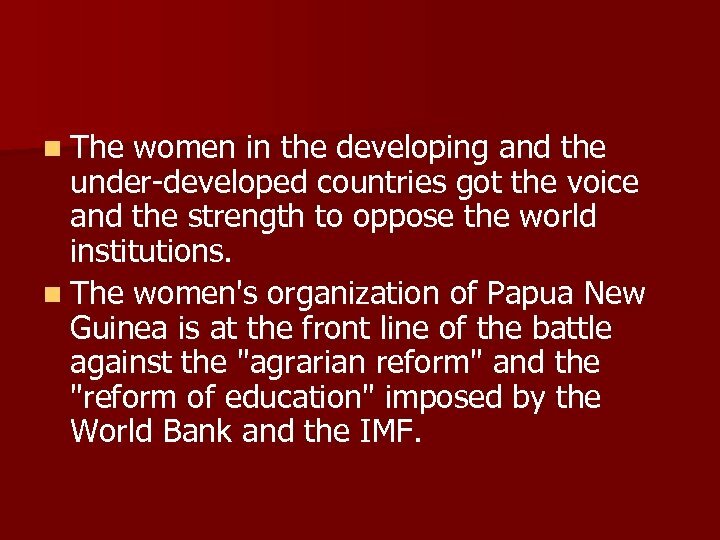 n The women's organization of Papua New Guinea is at the front line of the battle against the "agrarian reform" and the "reform of education" imposed by the World Bank and the IMF. 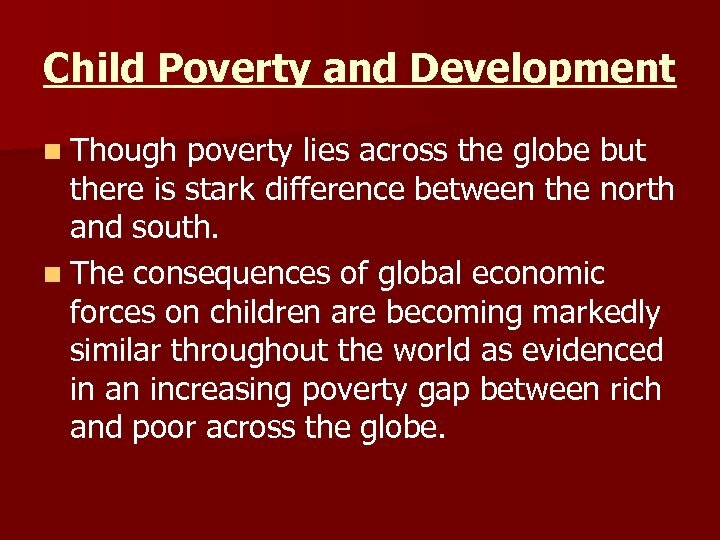 Child Poverty and Development n Though poverty lies across the globe but there is stark difference between the north and south. n The consequences of global economic forces on children are becoming markedly similar throughout the world as evidenced in an increasing poverty gap between rich and poor across the globe. 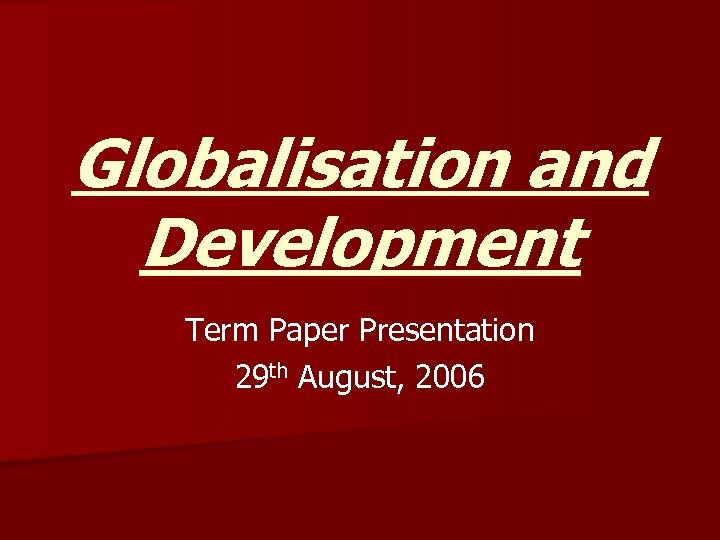 Conclusion n Globalisation has influenced various domains within the development studies in various ways. 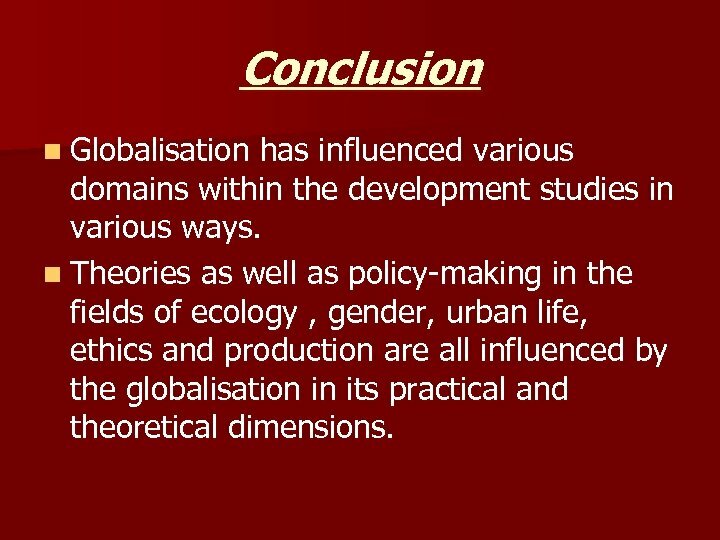 n Theories as well as policy-making in the fields of ecology , gender, urban life, ethics and production are all influenced by the globalisation in its practical and theoretical dimensions.